Josephine Marion’s father, Colonel Arthur Allen Owen (1842-1916), pictured left, was a decorated military man. Born in Bilston, Staffordshire, he had served in South Africa during the Ninth Cape Frontier War (1877-78) and was invalided home around the beginning of the Anglo-Zulu War in early 1879. 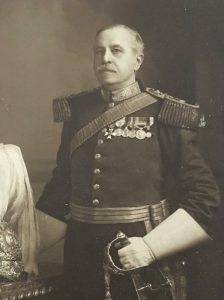 He retired with the honorary rank of Colonel in 1881 and was appointed to the Honourable Corps of Gentlemen-at-Arms (ceremonial bodyguard) to the Queen in 1885. In 1901, he was awarded the Order of Mercy. This was bestowed as a reward for personal services gratuitously rendered to The League of Mercy, founded in 1899 by Royal Charter of Queen Victoria. The objective of the League was to establish a large body of voluntary workers who would assist with the maintenance of voluntary hospitals and relieve sickness and suffering. Josephine Marion’s mother, Janet Sophia Lewis, (1856-1905) was also from Bilston, Staffordshire. Janet and Arthur had married in 1879 at St Luke’s Parish Church in Chelsea, Middlesex. Josephine Marion was the first of three children, born in August 1880 in Mussoorie, (a hill station in the northern Indian state of Uttarakhand). Her brother, Arthur Elibank Lewis, was born in London in December 1881; and a sister, Madeleine Harriet, was also born in London in May 1883. 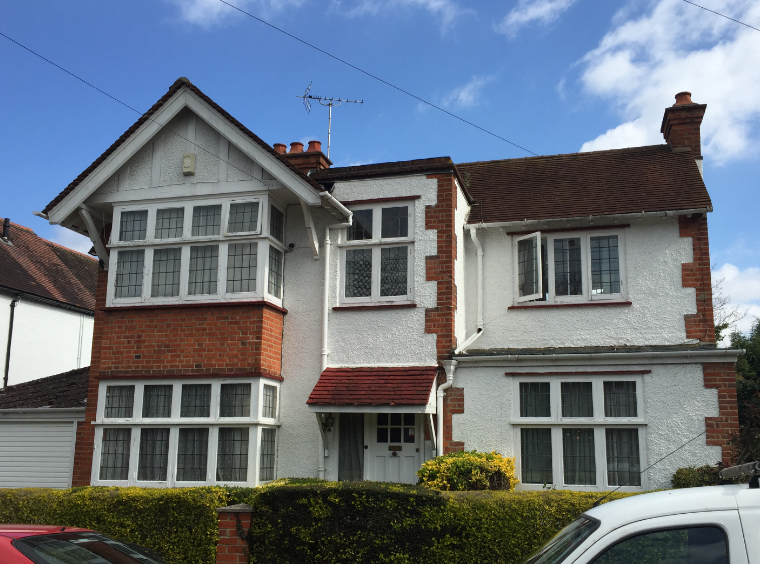 The children were brought up at 34 Baron’s Court Road, West Kensington where the family had a cook, nurse and parlour maid. They moved to Datchet around 1903, and lived at Polesden, 18 Buccleuch Road, left. Their mother, Janet died in early 1905, age 48. In December that year, Josephine Marion’s sister, Madeleine, married Captain Arthur Cecil Northey. The family was still in mourning so a quiet wedding was held at St Mary’s Church. During WWI, the local papers recorded the Owens’ donations to the VAD hospitals. Colonel Owen donated cigarettes to the VAD hospital, Middle Green, in November 1915, and £1 to the Slough VAD hospital in August 1916 for the ‘comforts of soldiers’. 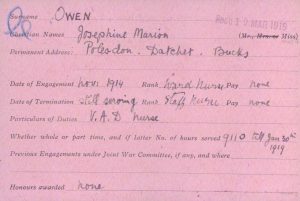 Josephine Marion’s Red Cross records, below, show that she started working as a nurse very soon after war was declared. 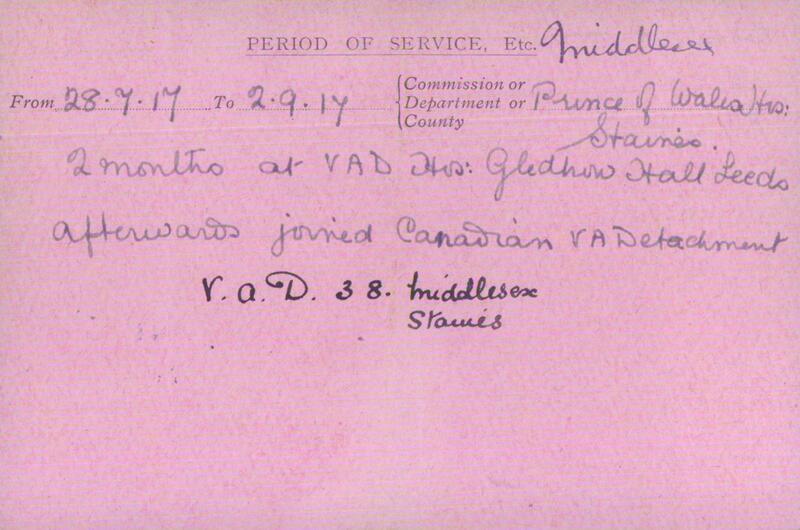 Her records indicate that she was a VAD Ward Nurse from November 1914, later promoted to Staff Nurse. 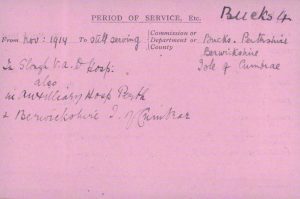 By 30 January 1919, she had served 9110 hours and was ‘still serving’. The record cards indicate that she worked at Slough VAD Hospital Langley (Bucks 4), also in the Perth auxiliary hospital in Perthshire, and hospitals in Berwickshire, and the Isle of Cumbrae. 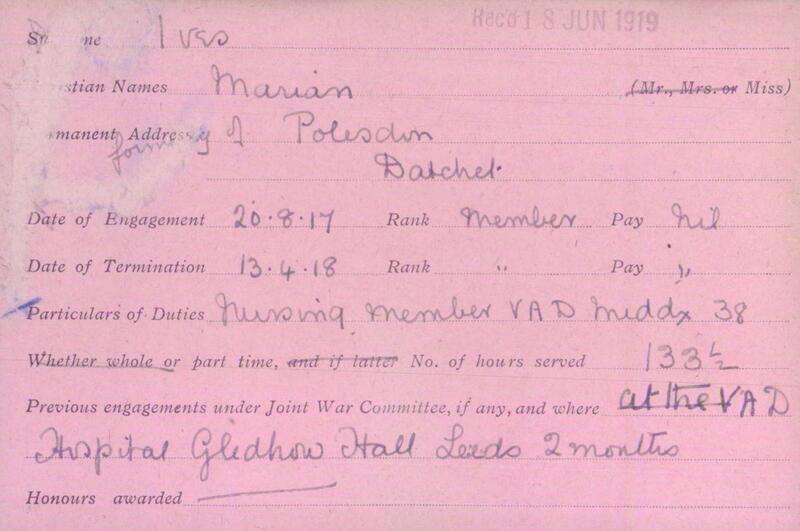 Oddly, there are also two Red Cross record cards for a Marion Ives, “formerly of Polesden, Datchet”, below. 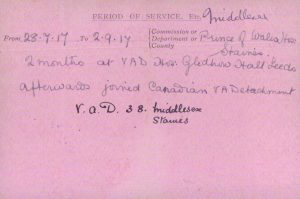 These list dates of engagement from August 1917 to April 1918, 133.5 hours at VAD 38, Prince of Wales Hospital (for officers), Staines. 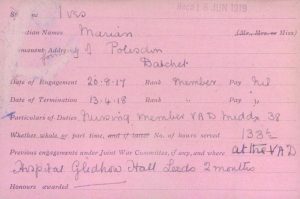 They note that Marion had spent two months previously at Gledhow Hall, a VAD Hospital in Leeds, Yorkshire and afterwards joined a Canadian VAD detachment. Who was this? Josephine Marion’s brother had died in Canada in 1913 so the Canadian connection is interesting. But we have been unable to find a record of an Owen-Ives marriage and Josephine Marion’s probate records confirm that she died a spinster. Had Marion Ives been working at Polesdon? 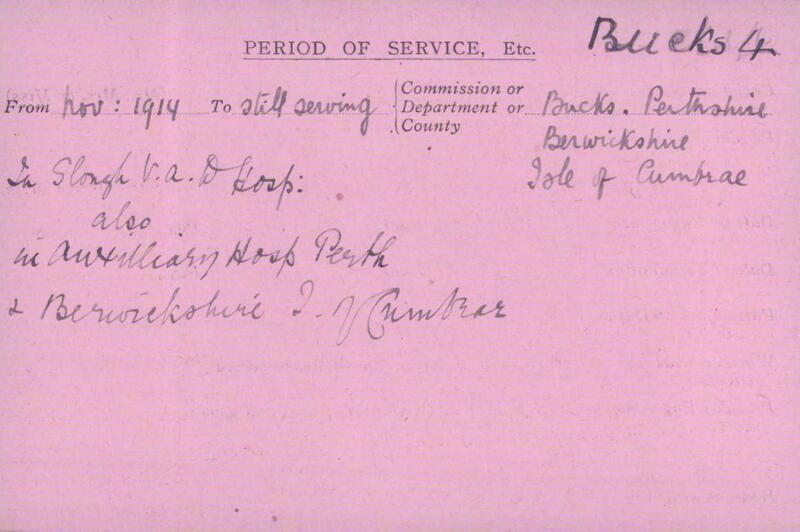 (There was no-one of that name working for the Owens on the 1911 Census but that was several years earlier.) 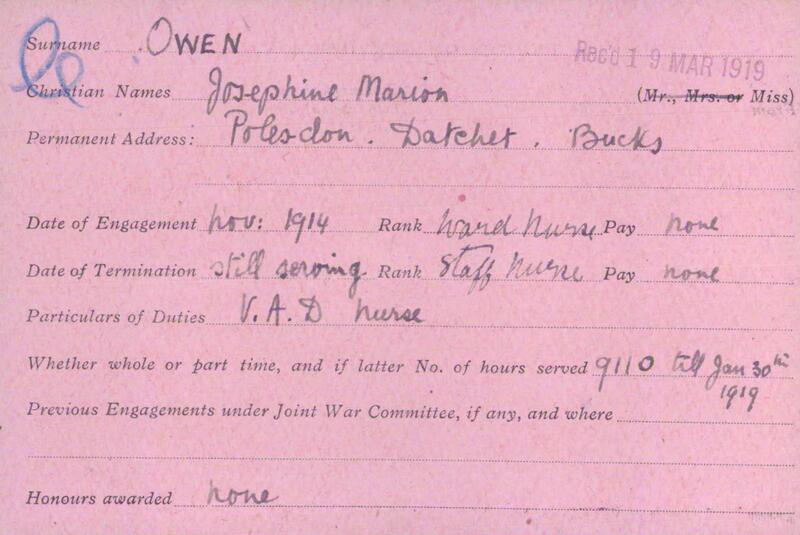 Between the dates of the first and second set of record cards, Colonel Owen had passed away, in April 1917, aged 75. Could Marion Ives perhaps have been looking after him? 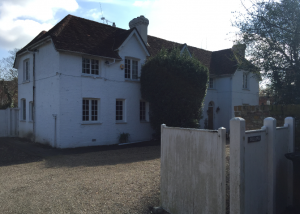 Sometime after his death, the Stevens family moved into Polesdon. They are listed in Kelly’s Directories from 1920. After the war, Josephine Marion’s sister, Madeleine, and her husband, Arthur, moved to The Willows, left, on the corner of Queens Road and Windsor Road, just a few hundred yards from Polesden. They are recorded there in Kelly’s Directories from the 1920s to 1950s. (They had three children.) Arthur died in 1931 but Madeleine continued to live there until her death in 1951. Josephine Marion visited India after the end of the war. There are passenger records of her sailing home from Madras to London in July/August 1920 aboard the ‘City of Marseilles’. In 1929, aged 48, she sailed from Liverpool to Newfoundland. Her address was listed in the records as The Corner House, Eton College, Windsor (next to Eton College Chapel). 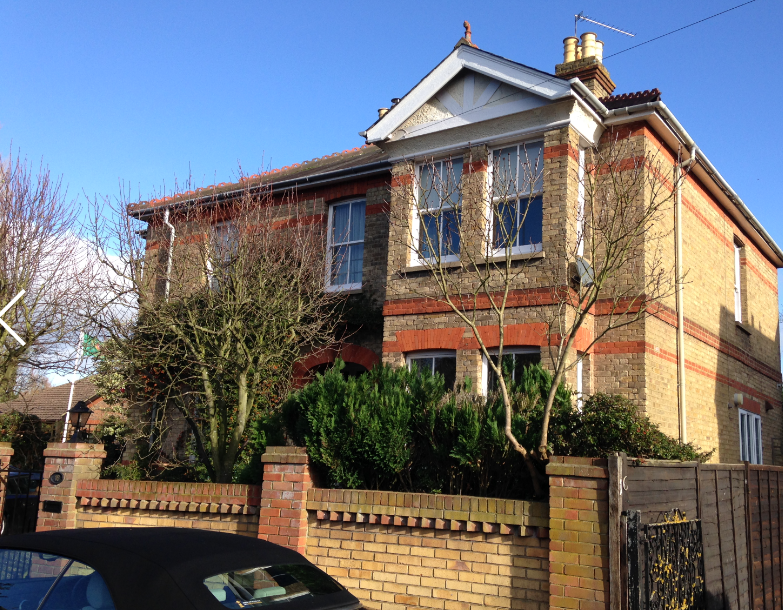 Josephine Marion returned to Buccleuch Road in the mid-1950s and lived at number 12, below, until her death on 26 February 1960.